Tonight, I went to an Intel Alumni (I spent 5 years at Intel) seminar featuring Intel alumni who are now focused on clean technologies. Legendary Andy Grove was the keynote speaker. It was great to see Andy Grove— it’s always a treat to hear his perspectives on business, technology, and the issues of the day. While he remains a senior advisor to Intel’s board and management, he is also actively interested in energy policy and often gives speeches on the topic. Along, with Grove’s perspectives, Intel alumni in the entrepreneur, product, or investor spaces of clean technologies provided additional perspective on the opportunities and challenges facing these technologies. Below are some of the key points made by Grove and others and my observations of the night. Grove stated the energy industry is a $6 trillion industry. Compare that to the information technology industry of $1 trillion. Competition for oil between US and China may become the defining issue of the next decade. Of the various uses of energy, Grove is most focused on the Transportation sector’s use of energy. This sector is primarily only served by petroleum and agrifuels products. Other large uses of energy including residential and commercial buildings can be served by renewable energies, but is not the case for the transportation industry. Grove’s view of technology of the evolution of a new technology is that it goes through phases, moving from the invention/discovery phase to the scaling stage and finally to the mainstream stage. One key challenge facing the clean technology industry is that the capital requirements to get to the mainstream stage where the capitalist economy would create positive cash flows from operations, first requires investment in the discovery stage and scaling stage. Venture capitalists will fund companies in this invention stage as the investment is at manageable levels, but the scaling stage takes much more investment and VCs and the public markets aren’t ready to fund this level. Getting past this stage and securing investment is a key challenge for the industry to be able to scale and become the norm. Half of energy provided is wasted. Most wasted energy occurs in residential buildings. Real improvements in energy efficiencies (heating, lighting, etc.) in residential buildings is a real opportunity. Improvements to water quality and efficiency is an underfunded clean technology. Solar technology is likely over-funded. Internal R&D investment in the energy space, excluding oil exploration and discovery, is less than R&D spend of Intel. A real problem and challenge. The building industry is in particular a legitimate opportunity. Research into material substitution should be a real focus area. The next big thing in green technologies?—many choices, but Grove and some of the panel touted the electrification of transportation. An interesting point made was to be careful on focusing on products or technologies that are heavily reliant on government subsidies. If administrations change or public opinion changes, the government support can disappear overnight and doom the products. This article in this week’s Newsweek gives an example of some of the declines in the momentum of solar technologies due to this very reason. Andy Grove continues to be a very effective speaker, and clearly demonstrates passion, but detached, about energy improvements. He created a data, fact based culture at Intel and he looks at energy policies with a similar analytical perspective. Speaking to Intel alumni, he cleverly weaved the Intel way into his speech—generating many laughs throughout his speech. 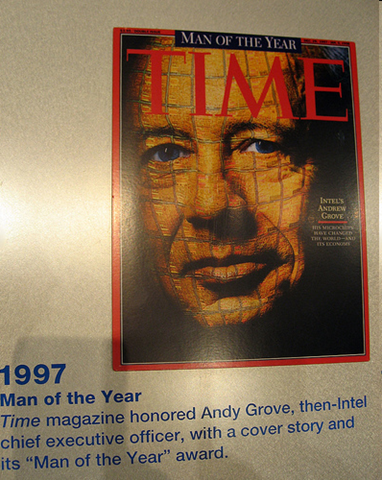 Grove was a tough, ruthlessly focused manager; in a room full of former Intel employees, many of whom who worked with him directly, the respect for him was immediate and the tone was cautious. After being away from Intel the last four years, the Intel culture is clearly exhibited when you look and speak to a room full of ex-Intel employees. It’s hard to explain the Intel culture, but it’s different and it comes back rather quickly.